Price per piece, offered individually. 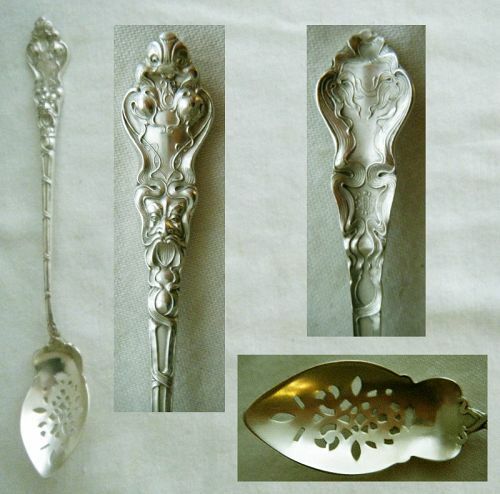 The Unger Brothers firm of Newark, New Jersey was known for its expressive Art Nouveau designs, produced in both flatware and jewelry in the last decade of the 19th and first decade of the 20th centuries. The pattern on this 6 3/8" long, .6 T. 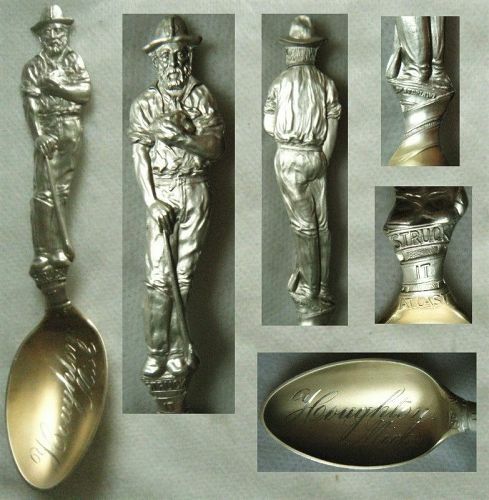 oz., olive spoon is "Douvaine," perhaps the company's most popular line. 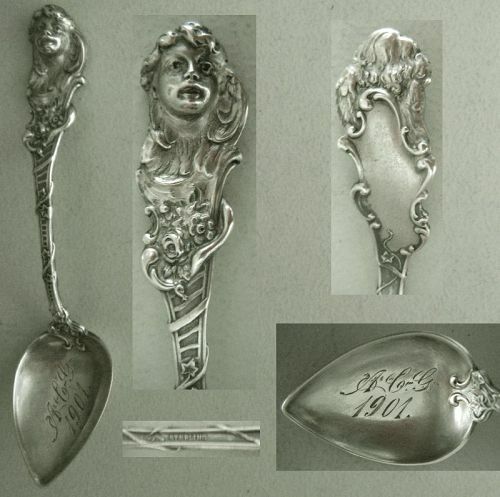 It features a dolphin or fish like image at the tip of the handle, and a renaissance or gargoyle like figure set midway on the handle. Wallace produced several Art Nouveau floral patterns in the early 20th century, of which "Peony" stands in a category by itself. 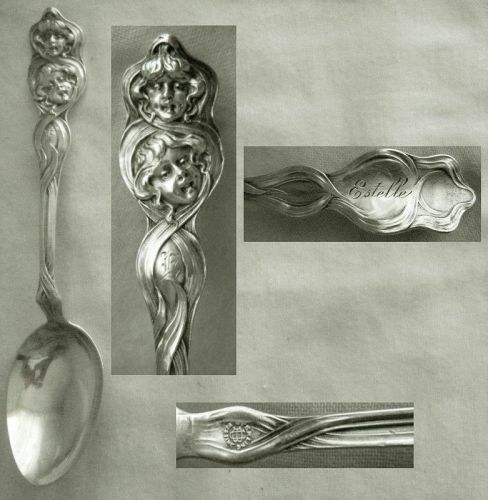 It is exceptionally heavy, has three dimensional intaglio (meaning cut in) and upraised surfaces, embodies a liquid look, and is highly expressive. This example is an 8 1/4" long, and consistent with the line, weighty at nearly 2.8 T. oz., medium sized cold meat fork. 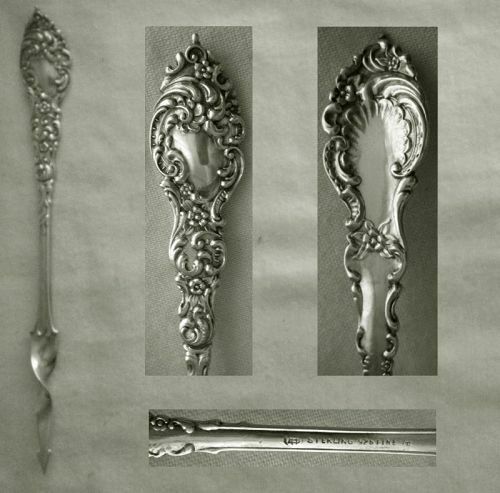 The serving end has four straight tines. Measuring 5 7/8" long and weighing approximately 1.0 T. 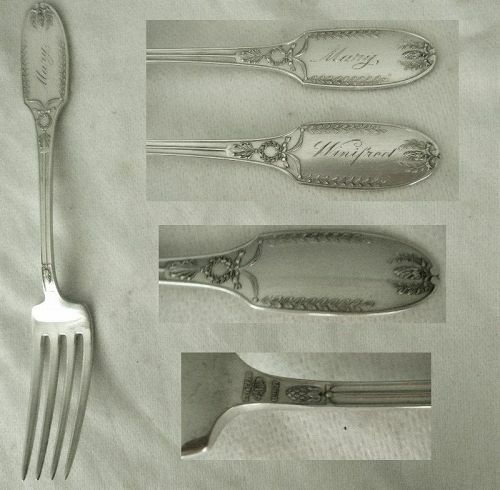 oz., this item has a large, shovel-like, ribbed and pierced with flange shoulders, serving end. 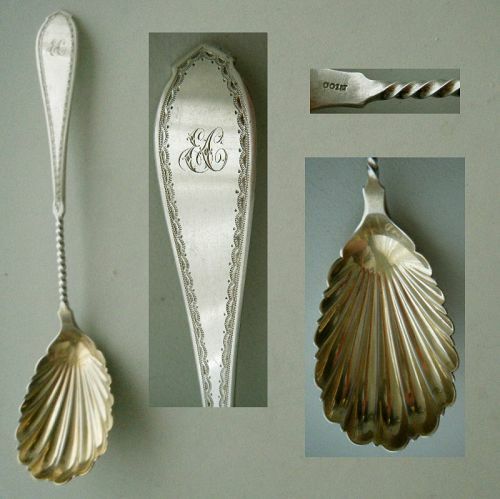 A nut scoop or bon bon, it was made by Watson whose pennant emblem and the word "Sterling" appear on the backside. 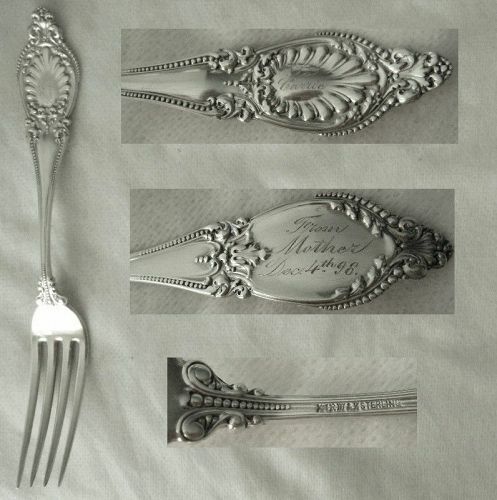 The theme of this 1895 pattern produced by Watson has an interesting origin.